Earlier this year, an anonymous 23-year-old woman started giving out free weed. We spoke to her. 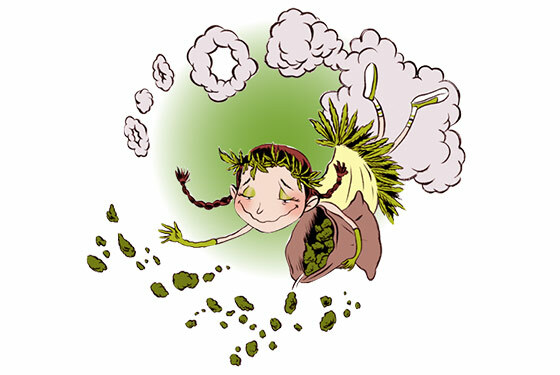 Why did you become the weed fairy? Well, a few months ago, I had the worst trip. My ex’s roommate’s brother brought some red-velvet weed cupcakes. I ended up vomiting, which, in my mental state, looked like blood and I thought I was repenting for my sins. I had a good dealer, and I bought enough weed to last me a year, but I decided to give up smoking after that cupcake trip, so what could be better than giving away something people would enjoy? I taped small amounts of weed to flyers that read THESE ARE TOUGH TIMES, TAKE THIS WEED & KEEP YOUR SPIRITS HIGH, and then I posted them at a few convenient locations. Were you afraid of being caught?